There is a lack of awareness and education in the rapid prototyping industry. And this is the direct result of the limited information that is available. Without good information, decisions can be difficult to make or risky to pursue. With 13 years of real-world, hands-on experience in rapid prototyping, we can help you make better business decisions and improve the results gained from your rapid prototyping technologies. How do the technologies compare? Both users and rapid prototyping manufacturers are seeking information and answers to develop strategic and tactical plans. And that is where T. A. Grimm & Associates comes in. Our consulting services provide the answers and the information for better business decisions. 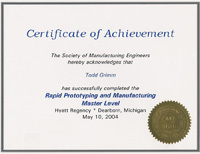 Master Level Certificate for Rapid Prototyping & Manufacturing awarded to Todd Grimm by Society of Manufacturing Engineers. In 1990, Todd Grimm, president and principle consultant, entered the rapid prototyping industry. Working for rapid prototyping service bureaus until 2002, he has experience in both the day-to-day and long-term, strategic management of rapid prototyping operations. Addressing sales, marketing, operations, finance, and general management issues and initiatives, Todd has hands-on, real-world experience in all aspects of rapid prototyping and business. What many find unique is that Todd is not only a business person, he is also a mechanical engineer, author and speaker. For each project, he blends his experience and skills for sound, practical business decisions. For more information on Todd Grimm, visit About Todd Grimm. To review some of his work, we recommend that you visit Publications. Realize all of the benefits of having a business consultant on staff but with greater flexibility, reduced expense and lower overhead. Small businesses don't need the addition of another top-notch management employee, so why hire one? Now you can have an industry expert at your disposal throughout the year without hiring a full-time employee. Designed for those companies that only require a few consulting projects in the year, this pay-as-you go service can be used for everything from speaking engagements to competitive analysis to system benchmarking. Quoted as a flat fee, there will be no surprise expenses. With either option, you will benefit from 14 years of hands-on experience in the rapid prototyping and product development industries. Call today (or send an email to tgrimm@tagrimm.com) to discuss your ideas and challenges.